"Ascension (mystical)" redirects here. For a different mystical ascension, see enlightenment (spiritual). For other uses, see ascension (disambiguation). Entering heaven alive (called by various religions "ascension", "assumption", or "translation") is a belief held in various religions. Since death is the normal end to an individual's life on Earth and the beginning of afterlife, entering heaven without dying first is considered exceptional and usually a sign of a deity's special recognition of the individual's piety. Ascension Rock, inside the Chapel of the Ascension (Jerusalem), is said to bear the imprint of Jesus' right foot as he left earth and ascended into heaven. Unlike the other entries in this article, this paragraph does not, in the view of most Christians, relate to "entering Heaven alive". Jesus is considered by the vast majority of Christians to have died before being resurrected and ascending to heaven. In regard to his mother Mary, Eastern Orthodoxy considers her to have died prior to being assumed (translated) into heaven. In like manner, Roman Catholicism affirms that Mary, the mother of Jesus, suffered death prior to her assumption which has been "expressly affirmed in the Liturgy of the Church" and is expressly seen in paragraph 20 of the proclamation of this teaching. Protestantism generally believes that Mary died a natural death like any other human being and was not subsequently assumed into heaven, although the Anglo-Catholic tradition of Anglicanism often affirms the assumption. Most Christians believe Jesus did initially die, but was then resurrected from the dead by God, before being raised bodily to heaven to sit at the Right Hand of God with a promise to someday return to earth. The minority views that Jesus didn't die are known as the Swoon hypothesis and Docetism. Since the adoption of the Nicene Creed in 325, the Ascension of Jesus into heaven, as related in the New Testament, has been officially taught by all orthodox Christian churches and is celebrated on Ascension Thursday. In the Roman Catholic Church, the Ascension of the Lord is a Holy Day of Obligation. In the Eastern Orthodox Church the Ascension is one of twelve Great Feasts. In the Reformed churches' tradition of Calvinism, belief in the ascension of Christ is included in the Westminster Confession of Faith, the Heidelberg Catechism and the Second Helvetic Confession." The "Rapture" is a reference to "being caught up" as found in 1 Thessalonians 4:17, when the "dead in Christ" and "we who are alive and remain" will be caught up in the clouds to meet the Lord. Another kind of entering Heaven alive is mentioned in the Old Testament: the prophet Elijah and the patriarch Enoch, son of Jared and ancestor of Noah. The doctrine is based on Sacred Tradition that Mary, mother of Jesus, was bodily assumed into heaven. For centuries before that, the assumption was celebrated in art. The proclamation states that Mary suffered bodily death before being assumed into Heaven. Some theologians have argued that Mary didn't die, but this is contrary to the text of the dogma's proclamation. 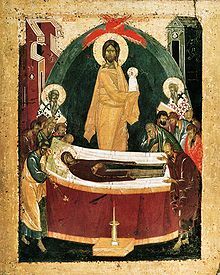 Orthodox icon of the Dormition of the Theotokos (1392, Theophan the Greek). The Eastern Orthodox Church teaches that three other persons were taken bodily into heaven: Enoch, Elijah (Elias) and the Theotokos (Virgin Mary). Similar to the Western "Assumption" of Mary, the Orthodox celebrate the Dormition of the Theotokos on August 15. Unlike Western uncertainty about Mary's physical death, the Orthodox teach that Mary died a natural death like any other human being, that she was buried by the Apostles (except for Thomas, who was late), and three days later (after Thomas had arrived) was found to be missing from her tomb. The church teaches that the Apostles received a revelation during which the Theotokos appeared to them and told them she had been resurrected by Jesus and taken body and soul into heaven. The Orthodox teach that Mary already enjoys the fullness of heavenly bliss that the other saints will experience only after the Last Judgment. Apollonius of Tyana was said to have been assumed into Elysium by Philostratus. Sant Tukaram was taken to Vaikunta on Garuda, which was witnessed by all the village people. Chaitanya Mahaprabhu disappeared after entering the temple deity room of Lord Jagannath. Ramalinga Swamigal (Swami Ramalinga), a great Sage revered by his teaching. Ramalinga supposedly attained the Supreme Body of the Godhead when Divinity itself merged with him. He was reported to have disappeared after deciding to de-materialize his immortal body by his own free will, his body was never found. The Mother (Mirra Alafassa), the foremost disciple of the Hindu philosopher and guru Sri Aurobindo, attempted the physical transformation of her body in order to become what she felt was the first of a new type of human individual by opening to the Supramental Truth Consciousness, a new power of spirit that Sri Aurobindo had allegedly discovered. She believed that she could create for herself a new kind of “light body”. However, she died and was cremated. Islamic teaching states that Muhammad ascended into heaven alive at the site of the Dome of the Rock. However, this ascent was temporary and he came back to Earth. It is ascribed to the exact descriptions presented in both the Quran and the Hadith. Islamic texts deny the idea of crucifixion or death attributed to Jesus by the New Testament. The Quran states that people (i.e., the Jews and Romans) sought to kill Jesus, but they could not crucify or kill him, although "this was made to appear to them". Muslims believe that Jesus was not crucified but instead he was raised by God unto the heavens. This "raising" is often understood to mean through bodily ascension. Some Islamic scholars have identified the prophet Idris to be the same person as Enoch from the Bible. This is because the Qu'ran states that God "raised him to a lofty station", and that has been taken to be a term for ascending, upon which it is concluded that "Idris" was "Enoch". In the Hebrew bible the word for "heavens" is shamayim. This is plural - it means "heavens", not "heaven" - but seems nevertheless to have a singular meaning: i.e., the older parts of the bible speak of "heavens" in the plural and Nehemiah 9:6 says, "... You made the heavens, even the highest heavens..." Shamayim also meant "sky", the atmosphere, as it does in modern English. The blue dome of the sky was called the raqia, and was believed to be a solid shield between the atmosphere and the true heaven where God lived. [dubious – discuss] Heaven was the realm of God, earth of mankind, and the underworld was for the dead, and travel between them was generally impossible, although God and his messengers frequently appear on earth and the dead can be summoned up from the underworld as the Witch of Endor summons the shade of Samuel. There are two possible exceptions to this general rule that humans could not go to heaven, Enoch and Elijah, but neither is clear. The Genesis 5:24 mentions Enoch as one who "...walked faithfully with God; then he was no more, because God took him away," but it does not explicitly say whether he was alive or dead, and it does not say where God took him. The Books of Kings describes the prophet Elijah being taken towards "shamayim" in a whirlwind, but the word can mean both heaven as the abode of God, or the sky (as the word "heavens" does in modern English), and so again the text is ambiguous. It is believed in Zoroastrianism that the Peshotanu was taken up into Heaven alive and will someday return as the Zoroastrian messiah. Members of various Ascended Master Teachings, a group of New Age religions based on Theosophy, believe that Francis Bacon underwent a physical Ascension without experiencing death (he then became the deity St. Germain). They also believe numerous others have undergone Ascension; they are called the Ascended Masters and are worshipped in this group of religions. The leaders of these religions claim to be able to receive channeled messages from the Ascended Masters, which they then relay to their followers. In C. S. Lewis's That Hideous Strength, those who ascended to heaven alive included Melchizedek, Frederick Barbarossa, King Arthur and Elwin Ransom. In C. S. Lewis's The Voyage of the Dawn Treader, Reepicheep the Mouse is permitted to travel into Aslan's Country while alive. He is next seen in The Last Battle where he is the first to greet the protagonists when they arrive at Aslan's Country. In J. R. R. Tolkien's Middle-earth legendarium, Elves who grow weary of life in Middle-earth may sail west to the Undying Lands. A few mortals also follow this route, including Eärendil, the Ring-bearers Bilbo Baggins, Frodo Baggins, and Sam Gamgee, and the Dwarf Gimli. In the fictional universe of the Stargate franchise, the Ancients, have learned how to "ascend" from the physical plane and have moved on to a higher plane of existence. In Gabriel García Márquez's One Hundred Years of Solitude, Remedios the Beauty, is said to be the most beautiful woman ever seen in Macondo, who unintentionally causes the deaths of several men who love or lust over her. She appears to most of the town as naively innocent, and some come to think that she is mentally handicapped. However, Colonel Aureliano Buendía believes she has inherited great lucidity: "It is as if she's come back from twenty years of war", he said. She rejects clothing and beauty. Too beautiful and, arguably, too wise for the world, Remedios ascends into the sky one afternoon in the 4pm sun, while folding Fernanda's white sheet. ^ "Apostolic Constitution of Pope Pius XII / Munificentissimus Deus / Defining the Dogma of the Assumption". Vatican.va. Archived from the original on September 4, 2013. Retrieved March 30, 2007. ^ Quotations as cited by Redman, Gary, article/Web page titled "A Comparison of the Biblical and Islamic Views of the States of Christ/ Part 2: The State of Exaltation", at "The Muslim-Christian Debate Website". Retrieved March 29, 2007. ^ 1 Thess 4:16–17 "For the Lord Himself will descend from heaven with a shout, with the voice of an archangel, and with the trumpet of God. And the dead in Christ will rise first. Then we who are alive and remain shall be caught up together with them in the clouds to meet the Lord in the air. And thus we shall always be with the Lord." ^ Brumley, Mark,. "Mary's Assumption: Irrelevant or Irreverent?". Catholic.net. Retrieved March 29, 2007. ^ Brumley, Mark. "Mary's Assumption: Irrelevant or Irreverent?". Catholic.net. Retrieved March 29, 2007. ^ Lendering, Jona. Apollonius of Tyana. Retrieved March 28, 2007. ^ Ramnarayan Vyas (1992). Nature of Indian Culture. Concept Publishing Company. p. 31. ISBN 9788170223887. ^ Manabendra Nath Roy (2001). The Radical Humanist, Volume 65. p. 21. ^ Prabhat Mukherjee (1981). The History of Medieval Vaishnavism in Orissa. Asian Educational Services. p. 159. ^ Roshen Dalal (2010). Hinduism: An Alphabetical Guide. Penguin Books India. p. 332. ^ Shafaat, Dr. Ahmad, Islamic View of the Coming/Return of Jesus" article dated May 2003, at the Islamic Perspectives Web site: "In 4:159, after denying that the Jews killed or crucified Jesus and after stating that God raised him to Himself, the Qur`an says ...". Retrieved March 29, 2007. ^ In the Christian bible, II Corinthians 12:2 says, "I know a man in Christ who fourteen years ago was caught up to the third heaven..."
^ Derech Eretz Zuta (post-Talmudic tractate) cited in: Rabbi Yehudah HaLevi and Rabbi N. Daniel Korobkin (2013).The Kuzari: In Defense of the Despised Faith. Feldheim Publishers. Jerusalem. pp. 137-138. ^ "Enoch". JewishEncyclopedia.com. Retrieved 2014-03-05. ^ According to The Kuzari, it was Eved, king of Cushi. ^ "Bithiah". JewishEncyclopedia.com. Retrieved 2014-03-05. Encyclopedia of Religion s.v. Ascension; Eliade, Mircea, ed. in chief. New York: Macmillan, 1987. This page was last edited on 22 April 2019, at 12:00 (UTC).